Angola's landmass covers shorelines, arid expanses of deserts, wetlands, savannas, and moist jungles. 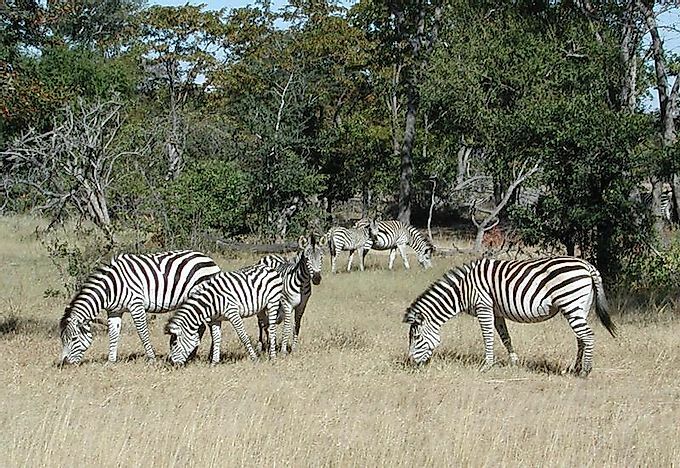 Zebras in the grasslands of Angola. This ecological region is classified into tropical and subtropical moist broadleaf forests Biome. These forests extend widely along the Atlantic Ocean’s coastline in different African countries such as Congo, Angola, Gabon, Cameroon and Equatorial Guinea. In Angola, the forests are mainly concentrated in the Cabinda Province. The region has a wide expanse of the Maiombe forest which provides an ecosystem for a wide range of animals and plants. Hundreds of different species of butterflies, forest elephants, chimpanzees, monkeys, and gorillas are in the region. The ecological area also is home to rare and coveted types of mahogany, which has increased concerns of extinction due to rapid deforestation. Over the years, the Angolan government has initiated conservation efforts with local communities near the region and with its neighbors such as Congo. There are plans to establish a national park in Cabinda by 2017 to protect the fragile ecosystem and has the potential to be the most effective measure ever. This ecological region is classified into tropical and subtropical dry broadleaf forests Biome. The climate of the area is that of Tropical Savannah, where wet as well as dry seasons throughout the year is common. The region features the tree Cryptosepalum exfoliatum, pseudotaxus, which makes up stretches of tropical evergreen forests. The area extends from the Western part of Zambia into Angola. Other trees found in the region include African rosewood, Mopane tree, Brachystegia floribunda, and Bersama abyssinica. The area supports a variety of fauna including a species of the African grass mouse, which is near-endemic to the region. The region is also home to different ungulates and predators such as the yellow-backed duiker and the blue duiker. The kudu, Bushpig and wild dog are also found in the region. The area is also home to a variety of bird species such as the Red-throated crested guinea fowl, Ross’s turaco, and the African crested flycatcher. The ecological region is mostly uninhabited and inaccessible and mainly remains in its natural state. Angolan Miombo Woodlands is classified into the tropical and subtropical grasslands, savannas and shrublands Biome. The ecological region covers much of Central Angola and stretches into the neighboring Democratic Republic of Congo. The region has a tropical climate where a mean temperature is recorded throughout the year. The name is derived from the dominant species of trees called Miombo trees in Swahili (Brachystegia). These trees burn easily, and fires are a common occurrence. The ecological region is home to a variety of wildlife such as zebras, elephants, antelopes, rhinos, lions, leopard, cheetah, giraffes, bushbuck, waterbuck and tsessebe. The expanse has abundant bird life, and the black-tailed cisticola is endemic to the region. Conservation efforts in the area have been largely curtailed by the civil war that started in 1974 in Angola. The war facilitated illegal poaching and deforestation due to instability. These factors have put the flora and fauna of the region at sustainability risk. The Angolan Mopane Woodlands ecological region is classified under the tropical and subtropical grasslands, savannahs and shrublands Biome. The area is located in the South Western part of Angola and stretches to Northern Namibia. The region is characterized by the dominant mopane trees. The mopane forests support a wide variety of fauna such as black rhinos, lions, zebras, antelopes, elephants, cheetahs, and leopards. The area is also home to abundant bird and insect species. Mean annual rainfall in the region lies between 400mm and 600mm. Conservation efforts such as the Mupa, and Bicauri National Parks have been damaged by the civil war in Angola. The region remains threatened by human encroachment. Other ecological regions in Angola are: Central Zambezian Miombo Woodlands, Southern Congolian Forest-Savannah Mosaic, Western Congolian Forest-Savannah Mosaic, Western Zambezian Grasslands, Zambezian Flooded Grasslands, Angolan Montane Forest-Grassland Mosaic, Angolan Scarp Savanna and Woodlands, Kaokoveld Desert, Namibian Savanna Woodlands, Central African Mangroves, Southern West Coastal Equatorial, Kasai, Lower Congo, Cuanza, Etosha, Namib Coastal, Upper Zambezi Floodplains, Zambezian Headwaters, Okavango Floodplains, Namib Coastal and Angolan Coastal.